So far in various articles, I have discussed about Events and Event handlers. To give you a fresh start, lets have a look on Events and Events handler again. Let’s start with an example. Say, I have placed a CommandButton in my worksheet using Developer ⇒ Controls ⇒ Insert ⇒ ActiveX Controls ⇒ Command Button like the following figure. Caption and ForeColor properties have been changed using the Properties window for this control. A Command Button placed in the worksheet. Excel Event Handler in VB Editor. This handler is for CommandButton1 and it is a click event. This Subprocedure is called Event Handler as it executes when someone clicks on the Command Button. When I click the command button, cell A1 in my worksheet gets blue as its background color. An event happens, and Event Handler executes. Cell A1 gets blue color when I click the Command Button. Workbook events: I am pretty sure that you know what workbook is. Who don’t know, the following figure is for them. 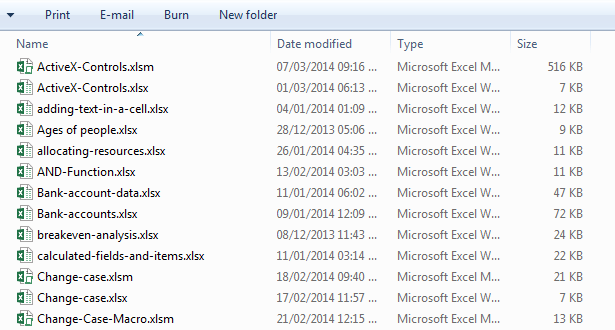 You’re seeing here total 13 workbooks; so, every Excel file is a workbook. 13 Excel files or 13 workbooks. 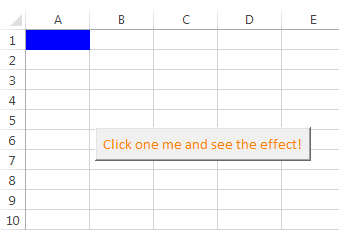 Open an Excel file from your existing ones. A workbook has a good number of events. To find out those, open the VB Editor from the Developer tab. Double click on ThisWorkbook in the project window and select Workbook in the code window. Then click Open, you will get all the available events associated with the workbook. Some of the available events for Workbook. VBA code that you will write for your workbook related events must be stored in the ThisWorkbook code module. Worksheet events: For a particular worksheet there are also a good number of events. See the figure below. Some of the worksheet events. VBA code that you will write for your specific worksheet events must be stored in that particular worksheet code module. Events not associated with objects: There exist two important application-level events: OnTime and OnKey. These two work differently from other events.